Despite the continued climb of the stock market and reports of American companies celebrating the new tax laws with employee bonuses, investors in January displayed a pullback from the enthusiasm they reported in December. 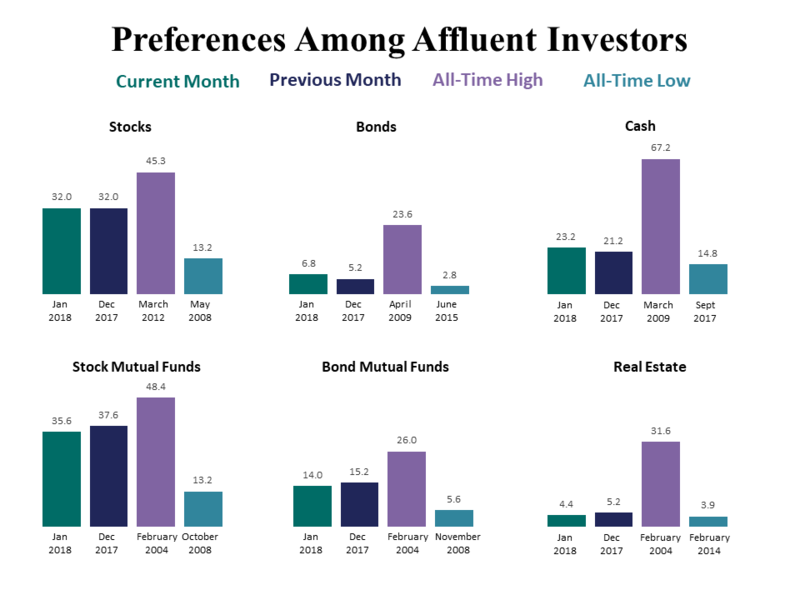 According to both the January Spectrem Millionaire Confidence Index (SMICI®) and the Spectrem Affluent Investors Confidence Index (SAICI®), investors expressed an intention to slow their investment roll in the coming month, with decreases in interest in investing in Stocks and Stock Mutual Funds and a greater intention to invest in Cash. Both the SAICI (an index of investors with $500,000 in investable assets) and the SMICI (for investors with $1 million in investable assets) fell in January, the first time since October both indices reported a drop. In both cases, the decrease was by 3 points, which is not a significant number but does indicate a fallback from the significant optimism shown in December. Among all investors, the intention to not invest further in the coming month rose to 36.40, the highest level since July of 2017. Both Millionaires and non-Millionaires recorded a decrease in Stock Mutual Fund investing, although the Millionaire decrease was by just 0.1 percent. Millionaire interest in Stock investing fell by 2.1 percent but rose for non-Millionaires by 2.8 points to 29.1 percent, the highest mark for non-Millionaires since May of 2017. “Not Investing” among non-Millionaires rose more than five points to 43.3 percent, and among Millionaire’s it went up to 29.3 percent. The decreases in Stock and Stock Mutual Fund investing was driven mostly by male investors, who dropped their Stock investing interest from 38.1 percent to 32.9 percent and their Stock Mutual Fund investing interest from 43.1 percent to 40.5 percent. Female investors actually reported a slight rise in Stock investing interest to 30.4 percent after a large drop in December. The Not Investing category drop was also driven mostly by males, with 33.5 percent indicating an intention to stay on the sidelines in the coming month compared to only 28.8 percent in December. The overall index between men and women was 14 among men (a decrease of 7 points) and -1 among women, a rise of 2 points. Among Millionaire men, the index fell from 24 to 19 after it doubled in December from 12 to 24. The drop in the Millionaire index number came from Republican investors, who dropped their index number from 32 to 11 in January. Among Millionaire Democrats, the index rose from 4 to 9 and among Independents it rose from 18 to 25. Republican interest in Stock investing fell 2.5 points to 30.90 but Not Investing rose less than 1 point. There was a similar small rise in Not Investing among Democrats but a 5-point rise among Independents to 31.51 percent. Retired and working investor often are at cross purposes related to the Spectrem Confidence indices. The drop in Stock investing was driven in January by retired investors, while working investors increased their interest in stock investing by more than 4 points. Cash investing among working investor rose 8 points to 29.9 percent, but working investors actually saw their Not Investing percentage drop to 21.3 percent, while retired investors increased their Not Investing percentage to 52.1.